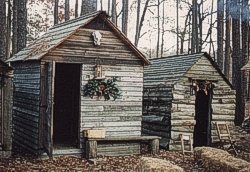 Cabins decorated for Christmas at Fort Branch. On the first Saturday in December at 7 pm, the Fort holds a candlelight tour of recreated Christmas scenes. Visitors enjoy refreshments, sharing an interest in history with the participants and caroling around the campfire.